Last night, Jio Garden BKC, Mumbai, hosted one of the most anticipated nights of the year for the film fraternity: the 64th Filmfare Awards 2019. With a number of prominent Tinsel Town stars in attendance, we saw dazzle and glimmer unfold on the red carpet of the event. The men really upped the glamour quotient this time with bold blazers and classic coats. 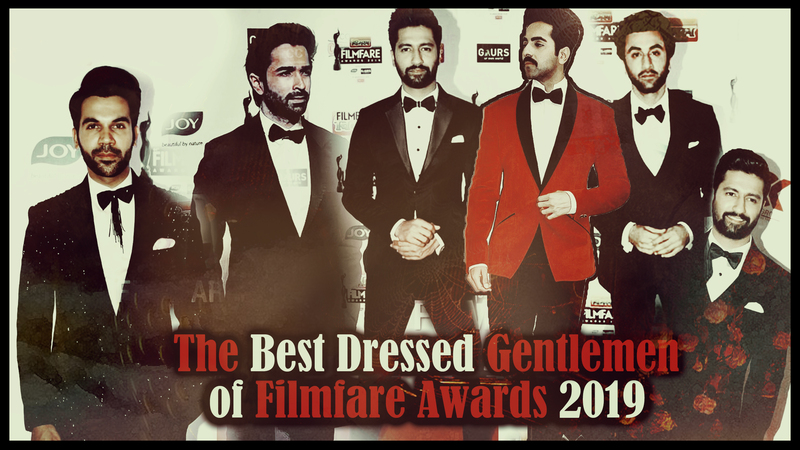 Hence, India-Forums brings to you what we feel were some of the best dressed gentlemen of the night. With the smash hit that was Sanju (2018), Ranbir Kapoor has been riding high on the professional front lately. The Brahmastra actor made several heads turn when he arrived at the event donning a royal blue suit with black lapels by Hugo Boss. He definitely played it safe, and a little boring, with the ensemble, but tried to add a twist with the somewhat rugged hairdo. However, even this was nothing new as we've seen that hairstyle before as well. He completed the look with a bowtie and that got him an extra point! Rao has showcased his versatility and acting chops time and again, but he is no newbie to the fashion glam game either. Almost always wowing us with his fashion choices, he did not disappoint this time either. He picked a sparkly black coat by Gaurav Gupta for his Filmfare 2019 appearance and ditched his signature boyish charms and clean-shaven cuteness for a dapper beard. He also sported a unique, shimmery bowtie and ended up looking perfectly dressed for the occasion. We may not have seen much of him in films so far, but judging by this Jalebi (2018) star's Filmfare stint, his style game is on point. Walking the carpet in a rather simple, yet stunning suit by Sahil Aneja, Mitra looked pretty suave. Stylist Desiree Fernades earns a thumbs-up for the sassy stubble she selected to go with the outfit, though we do feel she went with a tried and tested formula; just a little more experimentation would have fetched the look a flawless 5 from us! The multi-talented Badhaai Ho (2018) biggie has often gone a different route rather than the rather mundane blacks and blues and this time was no different. Khurrana chose a roaring red Gaurav Gupta dinner jacket, topping it off with a bowtie for the night. Brownie points to stylist Isha Bhansali for the neat hairdo. We do have to say that we did expect better in the jacket selection as this one came off looking rather plain and simple. Additionally, the thick moustache came off as a tad distracting, but it can be excused as it is a part of his upcoming project Article 15. Vicky Kaushal has been making waves and gaining accolades for his roles and fashion looks, and this time was no different. The handsome hunk made his way right into our hearts when we spotted him in a breathtaking Amit Aggarwal black tuxedo on the red carpet. He was flaunting a slightly funky hair style and we are all praises for his stylist, Amandeep Kaur, for overseeing this effortless style statement. Be it the black buttons on the white shirt that created a chic contrast or the adorable bowtie, Kaushal undeniably looked the classiest and we can't help but reward him with full points. Being one of the biggest award shows in Bollywood, it is quite obvious that stars bring their best to Filmfare every year. Once again, most celebs put their most fashionable foot forward and graced the event in all their elegance. However, we were also met with a few gaudy disappointments, but we decided that only impressive fashion choices would make it on our list this year. Do also check out our other article for the best dressed female celebs. But before you take our leave here, let us know your pick for the show-stealing male star of the evening by dropping a comment below. Editors: Minnie G. & Gunia K.